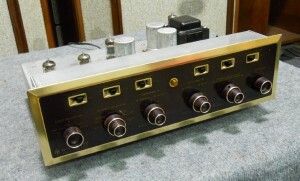 Very fun and good looking preamp from 1960s. I acquired this preamp with my HH Scott LT-150 power amp and together they work great. Now about the sound, the amp is just OK. The preamp was build during the days of low fidelity and because of that it has tones of circuitry that is not really needed nowadays. All the filters and all the switches just add more stuff to the signal path, making it more complicated, longer and muddier. How many of you would use Rumble or Scratch filters??? * coupling capacitors are just mediocre – ceramic caps are used extensively in the signal path. Replacing the caps with PIO or Teflon helped a bit to increase transparency of the preamp. * All the potentiometers are very noisy compared to modern equivalents. * Output is using negative feedback to fight the output impedance. * It has only MM phono stage, which is not a problem by itself, but using MM cartridges with output lower than 4 mV produced very weak bass. All in all, warm sounding preamp that is not very detailed. There are numerous improvements that could be made to the preamp that would make it would more dynamic and more transparent (replacing capacitors with PIO or Teflon – Adding Shunt regulator to the power supply, etc), but at the end of the day – don’t expect anything close to the modern preamplifiers that focus on sound quality instead of features. This is a romantic sounding amp that was good for its days, but can’t match current requirements.